The manager of Sarasota County’s Water/Wastewater Division has taken full responsibility for not making sure Siesta Key residents were aware that the closing of the island’s wastewater treatment plant had been postponed another year, and he has vowed that county staff will provide consistent communication going forward. David A. 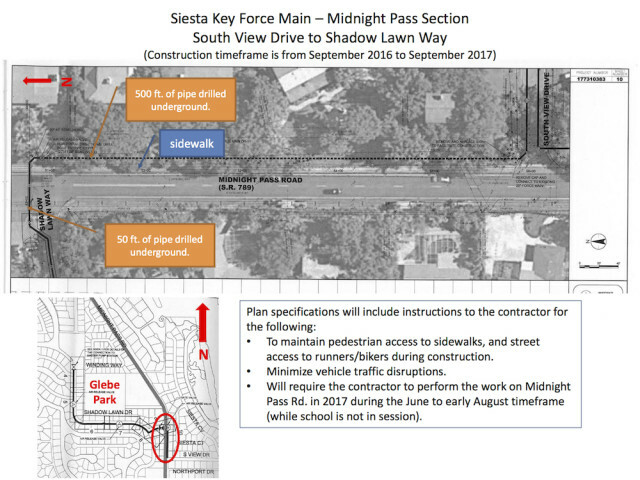 Cash faced about 60 people during the April 7 meeting of the Siesta Key Association, many of them angry that they had learned only after the fact that the Sarasota County Commission and the Florida Department of Environmental Protection (FDEP) had signed a revised consent order that officially moves the shutdown of the facility to June 18, 2018. 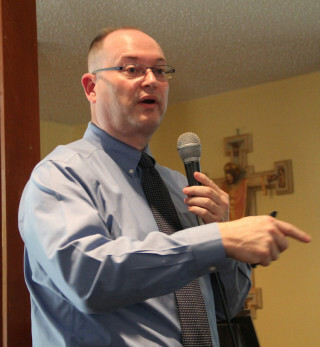 However, Gregory S. Rouse, the county’s engineering design manager overseeing the transformation of the plant to a master pump station, told SKA members gathered in the Parish Hall at St. Boniface Episcopal Church that the county plans to shut down the facility at the end of December 2017. That is a year later than the decommissioning previously had been scheduled. The FDEP permit for the plant’s operation will not end until June 2018, Rouse explained, calling that situation “a six-month float,” just in case the decommissioning is not completed as planned. For example, Rouse noted, a hurricane strike could cause a delay. In the meantime, Cash told The Sarasota News Leader in an April 11 telephone interview that representatives of a firm under contract with the county are going to make certain the Siesta plant’s odor controls are functioning correctly, and they are going to evaluate the possibility of using a neutralizing chemical at the “head works” — the area where raw sewage enters the facility — as a means of improving the conditions that drew numerous complaints during the SKA meeting. Nonetheless, two Siesta Isles residents — Lorie Tiernay and Joe Romano — have filed an appeal of FDEP’s issuance of the revised consent order with the county, asking that the department reverse its decision and enforce the previous closing date of December 2016. The couple’s letter was stamped as having been received by FDEP’s South District office on April 8. “If you’re an engineer working for a municipality, you have hundreds of stakeholders along the way,” Rouse replied. A request by residents on Southwind Drive to change the path of the new sewer and water lines that will go under the Intracoastal Waterway (ICW) necessitated a redesign of that part of the project, he explained. As long as no unforeseen issues arise that result in extra expense, Rouse continued, everything should proceed as planned. “So there’s no guarantee?” Moss asked him, drawing chuckles from audience members. “That’s a very good point,” Rouse replied. Yet another reason for the delay, Rouse continued, involved residents of the neighborhood in the vicinity of the intersection of Lockwood Ridge Road and Ashton Road, where the force main of the new sewer line will tie into another line in sections of the county’s Phillippi Creek septic system replacement project. 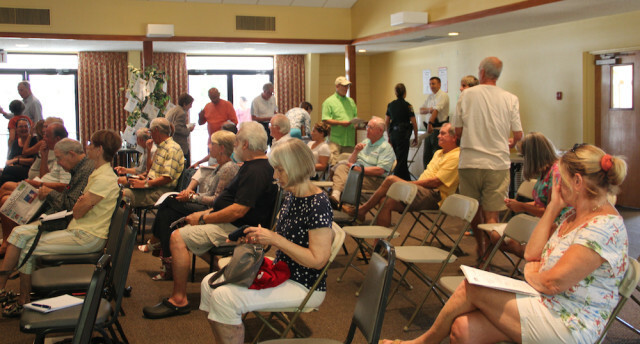 Those residents “kind of did not want a sewer connect occurring in their neighborhood,” Rouse said, “and that necessitated a number of conversations with the community,” including discussions between members of the County Commission and residents. 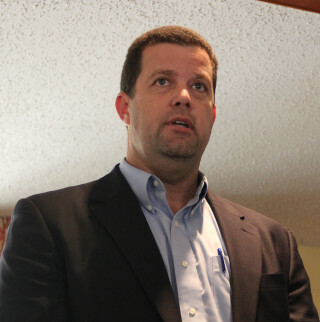 “Those discussions do take time, and those voices are heard,” Rouse pointed out. Rouse then provided details on the three phases, which will entail turning the Siesta facility into a master pump station that will send effluent to the county’s wastewater plant on Bee Ridge Road and to the Central County Water Reclamation Facility on McIntosh Road, both on the Sarasota mainland. 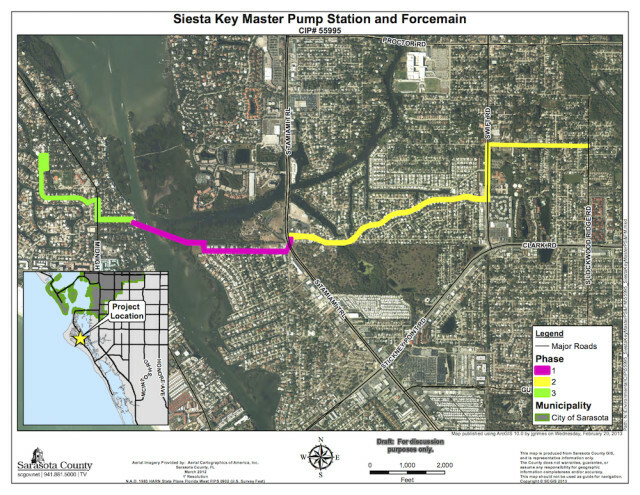 To remove the effluent from Siesta Key, Rouse continued, the county will construct a new 20-inch force main from U.S. 41, down the south side of Phillippi Estate Park and across the Intracoastal Waterway (ICW), installing booster pumping stations along the way. Expansions of the Bee Ridge and Central County plants also have begun, he noted. On April 26, Rouse said, the County Commission is expected to award a $4.3-million contract for the sewer force main and 5,000 feet of new water line. Most of the construction will take place from June to October of this year, Rouse added. 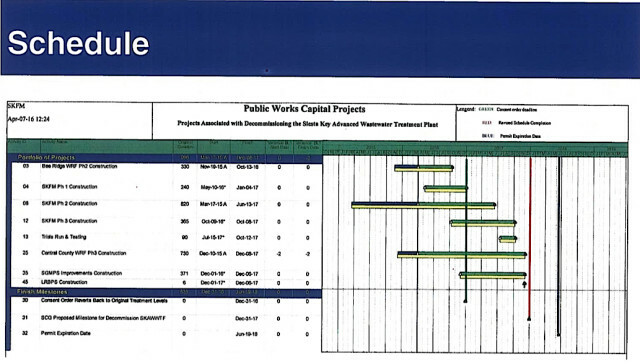 New nonmetallic components will be used for the existing water line, he said, and they will be put in approximately 60 feet below the ICW. 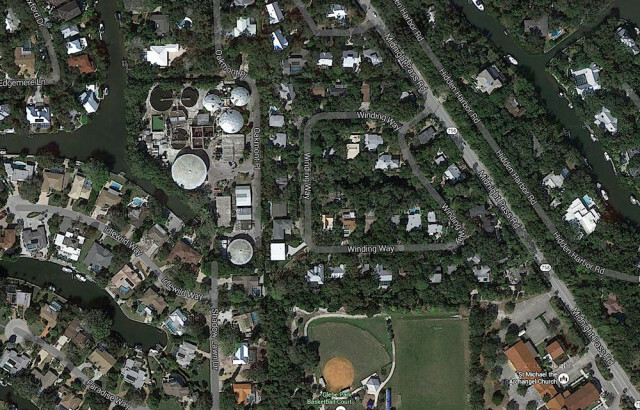 The final phase will include the construction of the new master pump station on Siesta Key at the site of the wastewater treatment plant; that work, he said, is budgeted at $5 million. Staff is awaiting the last FDEP permit, which is anticipated to be in hand soon, Rouse told the audience. 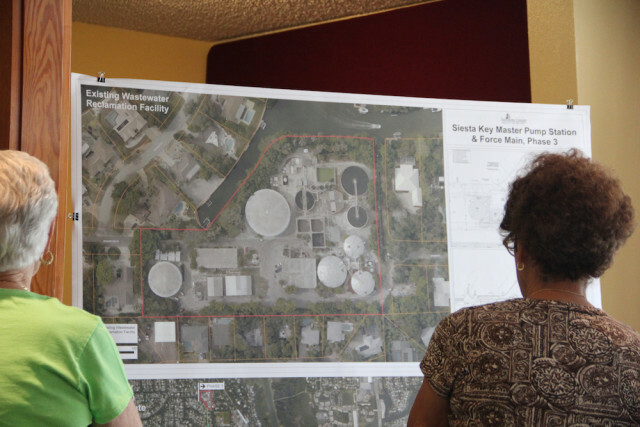 The master pump station work is expected to start in the fall, he pointed out. The pipeline will come up at a staging area in Siesta Cove, he said, and go across Midnight Pass Road, down Shadow Lawn Drive and into the treatment plant. The first part of Phase 3, he noted, will encompass the demolition of the bigger tanks that once stored water at the Siesta treatment plant. They no longer are in use, he said. After they have been removed, he noted, the contractor can use that area of the site for staging. As for the design of the pump station: He pointed out that it will have “quadruple redundancy” to make certain it can remain functioning in an emergency. He stressed that no delays are foreseen with any of the three phases. “I don’t feel like our voices are being heard,” Lorie Tiernay said. “We’re told, ‘We’re going to work on it, but there’s going to be normal smell,’” she added of the Siesta wastewater treatment facility. Planning outside activities at her home with the certainty that odor from the plant will not be a problem is “a luxury we’re not afforded,” she pointed out. County staff has said that “we shouldn’t worry about living next door to this stink factory. I find that really hard to believe and very upsetting,” Tiernay told Rouse and Cash. 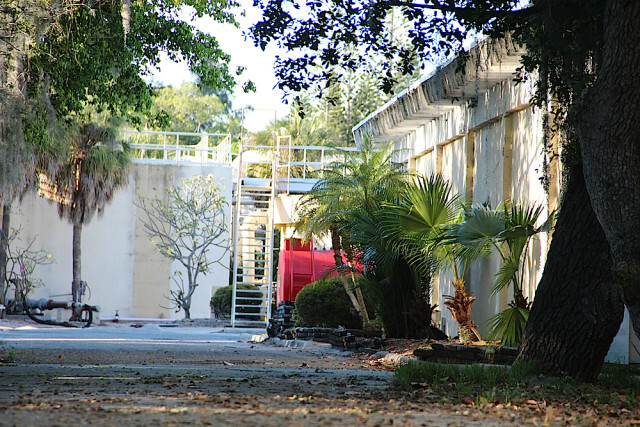 County staff has been making progress toward taking the Siesta plant offline, Rouse replied. “Are you telling me that, from the date of the consent order until today, the county has done everything in its power, given this the full attention that it deserves?” Tiernay asked. His department has, Rouse started to reply, prompting Tiernay to ask the same question of Cash. “I believe we have done everything possible since 2011,” Cash began. “That goes in direct conflict with what you told me,” Tiernay shot back. Tiernay noted that the consent order with FDEP calls for the county to reduce odors from the plant. Cash told her that is correct. Later, Joe Romano told Cash, “It seems to me there’s a major lack of accountability.” He added of the odors, “They’re almost constant. Tiernay asked Cash whether she and her neighbors could call a specific phone number to let county staff know when they are experiencing problems with the plant. Cash pointed out that he had given her the contact number for the local FDEP representative. If she did not find his response satisfactory, Cash continued, she could ask to speak to that man’s supervisor. Further, he said, “You can contact me directly,” adding that he also had given her the direct number for the wastewater treatment plant. 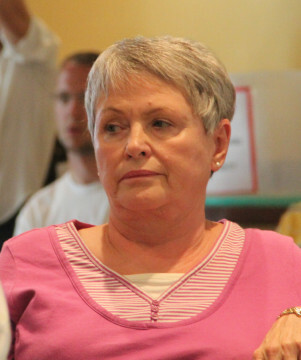 Then SKA Second Vice President Luckner noted that when she and her husband, Bob, had spoken earlier that day with County Commissioner Al Maio about the situation, Maio recommended residents call the County Contact Center at 861-5000. The staff members who answer calls can fill out incident reports and let the callers know the numbers to reference in the future, she added. Moreover, Luckner explained, the calls are recorded and logged. Staff makes sure complaints get to the appropriate county employees, she said. “I think the biggest issue that I’ve seen in this is the lack of communication,” Shay pointed out. “We were under the impression this [project] was going to be done by the end of 2016.” In fact, he noted, the SKA had set up a committee to consider how the plant property might be used for the benefit of the community in the future, and no county employee had let him or any other SKA directors know about the delay until Maio mentioned it at the SKA’s Annual Breakfast Meeting on March 5. “What I’d like to see going forward … is an overabundance of communication coming from your office,” Shay told Cash. It also would be helpful to have staff provide the SKA officers with updates that they could ensure would go up on the organization’s website, Shay added. “I’m certainly willing … to keep … the communication lines open,” Cash replied.